The history of the RAKAPOSHI is as ancient as man’s gaze. 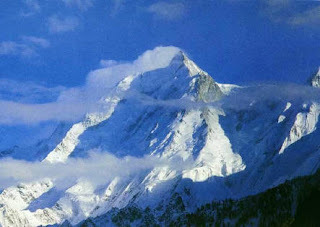 The highest and most visible mountain, the MOTHER OF MISTS, is part of the imaginary of each person, wayfarer or inhabitant, that has ever set his eyes and foot onto the Hunza Valley [North Pakistan]. Unlike K2 and other mountains of the Karakoram, the powerful bulk of DUMANI has accompanied all the people who have lived or travelled along one of the crucial nodes of the ancient caravan routes that connected East and West, variants of the famous Silk Route. 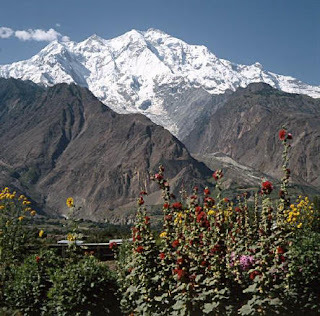 The valley dominated by RAKAPOSHI is harmonious and powerful, and has cultural and environmental riches. 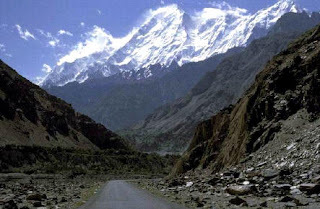 The valley was the centre of the ancient kingdoms of Hunza and Nagar, and Rakaposhi with its SHINING WALL is an unrivalled buttress to the greatest road ever built: the Karakorum Highway. 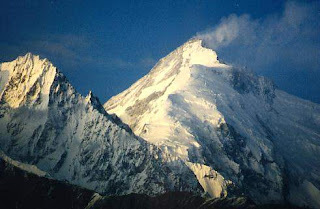 But RAKAPOSHI itself is one of the most magnificent works that nature has produced. 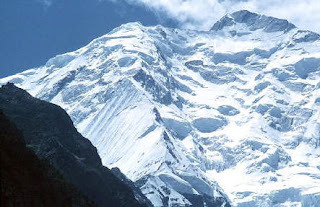 Rakaposhi is an extremely wide mountain, nearly 20 km from east to west, and is the only peak on Earth that drops directly, uninterrupted, for almost 6000 m from the top to the base. Few people have climbed RAKAPOSHI. Many people have dreamed of doing it. First amongst these, was the British art critic William Martin Conway who went in 1896 in order to explore its southern slopes. He did not find any easy access route, but it was the first true mountaineering expedition in Karakoram. In 1938 another enterprising British explorer, Campbell Secord tried to approach the great mountain from Jaglot, along the West face and tackling the longe NW Ridge up to 5800 m [Secord Peak]. In 1947 Secord returned with one of the patriarchs of world-wide exploration, Bill Tilman [one of the 20th century’s most important explorers, who disappeared in the waters of Antarctica in 1977], to find an alternative route to the same side on the mountain. After having made an attempt on SW Spur reaching quota 6200, Tilman again ascended NW Ridge reaching just over the 6000 m mark. 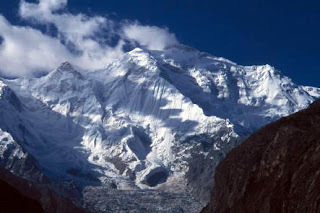 Exploration of the West face of Rakaposhi was completed in 1954 by an expedition from Cambridge University, led by the Genevan Alfred Tissières, who after having abandoned the umpteenth attempt on the NW Ridge, concentrated efforts on the Kunti Glacier, along the SW Spur that leads to the characteristic Monk's Head (6300 m), which is clearly visible both from north and south. Members of this strong expedition were the Austrians Anderl Heckmair [the first climber on Eiger North face in 1938], Matthias Rebitsch [the great climber and precusor of modern free climbing, famous for his attempt on the Eiger’s North face in 1937 and for the hard routes on Laliderer North face and on Goldkappel] and the English student George Band [the young mountaineer of the expedition that had already scaled Everest in 1953, and who, two years later, was to become the first ascender of the third highest mountain on Earth, the Kangchenjunga]. 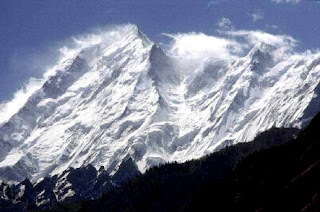 In 1958, an Anglo-Pakistani expedition, led by Royal Navy captain, Mike Banks, succeeded in reaching the Rakaposhi summit from Monk’s head, following the same route taken by Tilman. On the summit were Mike Banks himself and lieutenant Tom Patey. Banks learnt the lesson from his unsuccessful attempt in 1956 at the head of an Anglo-American expedition. The first ascenders reached the 7788 meters summit without the use of additional oxygen, but both suffered frostbite in their hands and feet. Almost 20 years passed, before, in 1979, other climbers tackled the infinite ridges of this great mountain and finally reached the summit. 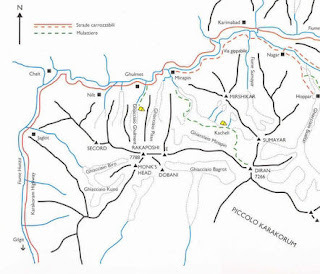 Starting from Biro Glacier, a Polish-Pakistani expedition reached NW Ridge and got to the top via a route that was as long as the first route, but much more difficult [the route was repeated in 1988 by a Dutch expedition]. Two illustrious names from Polish women’s mountaineering, Anna Czerwinska and Krystyna Palmowska, took part in this expedition. In the Seventies climbers turned their attention to the great inviolate walls of the highest summits. The Rakaposhi NORTH FACE, 20 km wide and characterized by huge spurs, was and is one of the most impressive walls that can be climbed. In 1971 and 1973 the German Karl Herrligkoffer [the famous Herr Doctor, organizer of the expedition to the Nanga Parbat of 1970 where Reinhold Messner lost his brother Günther] led two expeditions to the base of North Spur , but the attempt failed for strategic difficulties due to the complexity of the ascension. It was in 1979 that the sharp North Spur was scaled by a Japanese expedition from Waseda University led by Eiho Ohtani. The seven climbers besieged the mountain for six weeks bridling the spectacular spur with 5000 meters of fixed ropes, distributed on six high quota camps. Ohtani and Matsushi Yamashita did a bivouac at 7600 meters before tackling the difficult cliffs of the final crest. Three very hard lengths, VI (UIAA) and A2, at 7700 meters, had to be surmounted by the two Japanese climbers before reaching the top. Back to the bivouac, it took them two hard days to go back to base camp. The Japanese ascension passed unnoticed until 1984, when a Canadian team repeated the extraordinary route in the face of inclement weather. After various weeks spent, uselessly, equipping the route, the eight young, strong mountaineers decided to abandon their attempt on the North Spur [at first the Canadian team’s intention was to open a new route on North Face]. A few days before abandoning the mountain, an unexpected spot of good weather made them immediately change their plans. In seven days the three climbers, Dave Cheesmond, Barry Blanchard and Kevin Doyle, attained the summit in semi-alpine style leaving their mark on mountaineering history and in the pages written by the leader, Dave Cheesmond, to describe the difficult ascension, "one of geatest modern Himalayan ascents", defined "the Cassin ridge of the Himalayas" by the first class climber Barry Blanchard. An attempt to repeat this route was made by a Slovenian expedition in 1987, but failed. In 1985 the huge North Face received another important visit from a strong Austrian team guided by Edi Koblmüller. They aimed at the spur on left of the great wall, the North Spur of East Secondary Summit, where they traced another superb route. After 20 years from those enterprises on NORTH FACE, Rakaposhi still hides many incognito and is a challenge for the future of mountaineering. Although hundreds of mountaineers are crowded on normal routes of 8000s, and in spite of the poverty of ideas and ethics makes more and more appear a mirage the evolution of mountaineering in terms of exploration, inside and outside oneself, although many speak bad and little write well of contemporary mountaineering, nowadays mountaineering has still ways to explore and poles to discover. One of these is NW Spur, the longest spur of the world, still unclibed.